An adoption based on a single-page contract requiring love, a $25 dollar donation and some clothes. In 1985, the document on the right, still in its original envelope, was found in a barn in Morgan County, Berkeley Springs, West Virginia. The document is a one-page contract between the Children's Home Society of West Virginia and Mrs C., a contract which transferred the guardianship of Edward from the Society to Mrs C. It was signed in 1902. The full text of the contract is given at the foot of this page. This document is now winging its way to us but, in readiness for actually seeing it, I have been able to do some basic research to find out a little more about what might have been Edward's story. Edward was born in 1892 so he was ten when the contract was signed and he went to live with Mrs C.
We don't know how old he was when he came to the Children's Home Society but we do know that he would have arrived in one of two ways. The Society was relatively new when Edward was there. It had been founded in 1896 by Reverend Comstock who would himself, in those early years, travel the state by train picking up homeless children himself. Edward is likely to have been picked up from the streets in this way. In 1900, the West Virginia Legislature passed a law allowing county courts to pass their wards to the Society for placement "in good families as sons and daughters...". So, it is possible that Edward was made a ward of court for some reason and was then sent to the Society. Either way, Edward would have been taken to the Society's Davis Children's Shelter (pictured right) at 1118 Washington Street in Charleston. The Shelter was some 270 miles from Mrs C's house in Berkeley Springs, a very long journey for Edward to make to his new home. Edward would have lived here with the Reverend Comstock and his wife and, of course, the other children awaiting adoption. In these early years of the Society's work, all of the adopting families were protestant and most were farmers or miners. We know from the contract that Mrs C. was a widow and so we can perhaps assume that she was the widow of a farmer or a miner. The contract Mrs C signed asked for her to love, cherish, nurture, educate and properly care for Edward in a suitable and christian manner as if she was his birth mother, and suggested that this care would continue until he was 21 at which point she would ensure he had some money and two outfits so that he could make his own way in the world. 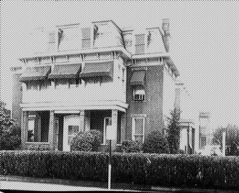 The contract also stipulated that Mrs C. made a contribution of $25 over five years to the Society. For Edward's part, the contract required him to be "reasonably faithful to the interest of Mrs C. until of legal age, and does not leave her employ of his own volition", suggesting that he would be expected to work for his new guardian. The contract was signed by Reverend Comstock himself. By the time Edward was adopted, the Society had adopted out around 200 children - that amounts to 28 children a year. Mrs C's copy of the contract was found in a barn in the place she lived when she signed the contract - I wonder if Edward stayed with Mrs C as well. Not all adoptions worked out - sometimes the child would be 'returned' to the Society, sometimes the child would run away. Looking at the contract with today's eyes, this single piece of paper seems to leave Edward potentially vulnerable and Mrs C perhaps unsupported. I wonder what contact the Society was able to maintain with the family and what checks they had in place. I wonder if Edward knew of his birth family or had any contact with them or with his friends from his time either before or at the Society. It is sad that we do not know more of what happened to Edward but very useful to have his adoption contract. It is interesting to see how these arrangements were made and how adoption and residential childcare has developed over the last 100+ years. If anyone has memories of the Davis Children's Centre, we love to hear from you. 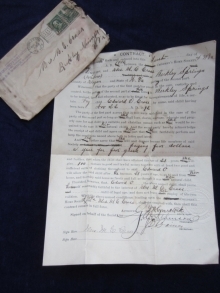 Articles of Agreement, Made and entered into this First day of May AD 1902 between the Children’s Home Society of WV, party of the first part, and Mrs C. (widow) of Berkley Springs, County of Morgan and State of W Va, to the party of the second part. Witnesseth, That the party of the first part has placed in the care, custody and control, to the party of the second part at her home in Berkley Springs to be trained, loved and educated, so as to be fitted for the requirements of life, a certain boy child, Edward C. by name, said child having been born Nov. 22 AD 1892. The party of the first part agrees that it will leave said child in the care of the party of the second part so long as she shall love, cherish, nurture, educate and properly care for said child in a suitable and christian manner, such as she would be required to do were it her natural child. And the second party hereby acknowledge the receipt of said child and agree[s] on her part that she will faithfully keep the conditions named above in letter and intent. And she further agree[s] that she will and do[es] now become [a] life member of the Society paying five dollars a year for five years. And she further agree[s] that, when the child shall have attained the age of 21 years, she will give 100 dollars in good and lawful money together with at least two good and sufficient suits of clothing throughout to Edward, and will allow the said child after he becomes 21 years of age, to go to and from her home, and to enjoy said home as freely and full as though it was her natural child. Provided however, that Edward the above named child, shall prove himself reasonably faithful to the interest of Mrs C. until of legal age, and does not leave her employ of his own volition. When the above named conditions binding upon the Children’s Home Society of W Va and Mrs C. shall be complied with, then shall this contract remain in full force. Signed by Mrs C. and, on behalf of the Society, by the Superintendent – Reverend Comstock, the President and the Secretary.